A statue of a Wallaby commemorates settlement in Wallabadah. 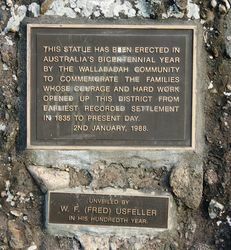 Wallabadah became a soldier settlement location after World War Two and residents in the town, known locally as "Wallaby", erected a sculpture of a wallaby sitting on a rock as a bicentennial project in 1988. The first European settlers began squatting in the district around 1830 and the Wallabadah Station (44 000 acres) was taken up about 1835. A village emerged which was of some importance in the 1850s, being located at the road junction of the mail coaches which came from the north and north-west. The town was also of some importance as a service centre for the surrounding area. However, it was surpassed by Quirindi when the railway arrived at the latter in 1877. Wallabadah became a soldier settlement location after World War II. In 1835 To Present Day.